Our world is saturated with a certain type of focus upon Christmas and preparing for its coming. That focus directs our attention to shopping and Christmas parties with friends. The time devoted to these things can squeeze out the spiritual aspects of Christmas for us and our families. Early in our married life, Cheryl and I began to celebrate Advent together. Our Advent celebrations have commonly involved Advent readings and an Advent wreath (with Advent candles). Advent seems even more important now that we have three children. 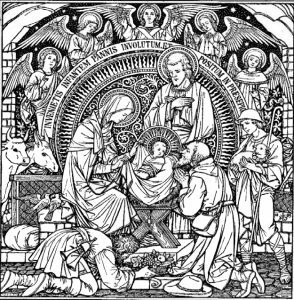 Advent is a time of preparation for Christmas that begins four Sundays before Christmas. The word “advent” is from Latin and has to do with the coming of a person or event. The coming of Jesus is an important theme of the New Testament. It has to do with the first coming of Jesus for his earthly ministry and the second coming of Jesus for his final acts of judgment and salvation. Advent concentrates our attention on his first coming, but it also reminds us that his second coming is something that we should also long for and anticipate. Advent is a way to capitalize on the natural excitement that so many people, especially kids, associate with Christmas. Our Advent devotions have been some of the best of the year. We have a time of Scripture reading. Sometimes we pray and sometimes we sing Christmas carols. Advent readings are also a way for adults to focus their thoughts in the midst of the many activities of the build up to Christmas. Over the years, Advent has become one of our family traditions that we have passed on to other families as well. I have put together some readings for Advent. You can find those here. Feel free to share these readings with others. I have also written a series of posts that will explain the readings week by week. Simply search my blog for posts on Advent readings and they will come up. Or, here is a link to my guide to the week one advent readings. Martha Zimmerman. Celebrating the Christian Year: Building Family Traditions around all the Major Christian Holidays. Minneapolis: Bethany House, 1994. Cheri Fuller. Creating Christmas Memories: Family Traditions for a Lifetime. Tulsa, OK: Honor Books, 1991.